On June 3, 1964 Ringo Starr inexplicably collapsed and was rushed to the hospital where it was found he was suffering from severe tonsillitis that required immediate surgery. Unfortunately for the band, Ringo had collapsed literally the day before they were due to embark on their world tour, for which many thousands of tickets had already been sold and a considerable amount of money had been spent booking venues, hotels, etc. Band manager Brian Epstein wasted no time in making calls to arrange a replacement drummer to stand-in for Ringo while he was recovering. This was much to the annoyance of George Harrison who reportedly told Epstein that “If Ringo isn’t going, then neither am I. You can find two replacements”. John Lennon and Paul McCartney were decidedly less upset with the idea of using a stand-in drummer and with the help of Epstein were eventually able to convince Harrison to soften his position by imploring him to think of the fans who’d be disappointed if they canceled the first part of their tour. Jimmie Nicol’s name was first brought up by producer George Martin who had worked with him previously and was aware that he’d been the session drummer for an album full of Beatles’ covers simply titled “Beatlemania”, meaning that he was able to play at least some of the Beatles’ back catalogue competently already. This was key given that they had just one day to find and train up a replacement for Ringo. In what must have been the most surreal day of Nicol’s life, he received a phone call to come down and audition, then upon arrival drummed through a handful of songs, after which he was immediately offered a gig with the most popular band in the world. When he accepted, he was fitted for a suit and had his hair cut into a traditional Beatles moptop. He was now set to go on a world tour as a temporary member of the Beatles. He also later admitted that his time with the band was a real eye opener for him in terms of how the Beatles behaved when the cameras weren’t watching. As for how the band treated him, Nicol has always been adamant that they were nothing but nice and welcoming to him during the two weeks he spent on tour and that they asked him each day how he was handling everything, to which he would always sheepishly respond “It’s getting better”. According to Edward Hunter Davies, the author of the only authorised biography of the Beatles, this was the original inspiration for the title of the later Beatles song, “Getting better”. I often went out alone. Hardly anybody recognised me and I was able to wander around. In Hong Kong, I went to see the thousands of people who live on little boats in the harbour. I saw the refugees in Kowloon, and I visited a nightclub. I like to see life. A Beatle could never really do that. As for how Ringo felt while this was happening, the band sent him numerous telegrams while touring making fun of his illness and joking that Nicol was getting comfortable in his suits, with the implication that maybe they might just replace their ailing drummer. Ringo himself had replaced Pete Best after occasionally subbing for Best when he was ill. Ringo would later say, with his tongue firmly in his cheek, “They’d taken Jimmie Nicol and I thought they didn’t love me any more”. In the shows in the Netherlands and Denmark, he was a bit nervous and just tried to stick to four-in-the-bar. John Lennon would turn around oftentimes and show him his strumming on the two- and four-beats so that Jimmie could stay in sync because the screaming of the fans was so loud. That was something he had always done with Ringo as well. As they got to Hong Kong and then played Adelaide, Australia, Jimmie really had it figured out. He started to add his own flourishes. When the song ended and John, Paul and George were bowing, Jimmie continued to play out a drum riff to milk the crowd for more applause. That never would have happened with Ringo. Ringo finished exactly when everyone else did and would bow at the same time. But now Jimmie was starting to feel his oats and use his own style. After a little under two weeks in the hospital, Ringo met up with the band again in Melbourne on June 14th after a brief stopover in Sydney. According to Ringo, he arrived a few hours before the rest of the guys and was nearly trampled to death by a crowd of fans. When the rest of the band arrived, the five of them had a drink together and went to bed. The next morning, Nicol had one final interview as an official member of the band before being driven to the airport to wait for a flight home, alone. 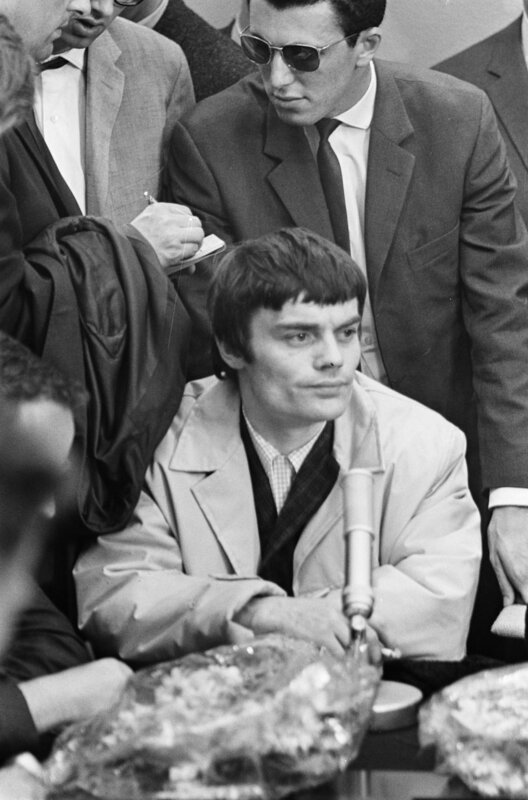 Before he left, Epstein took Nicol aside and presented the young drummer with a gold watch, engraved with the message “From the Beatles and Brian Epstein to Jimmie – with appreciation and gratitude”. Epstein also gave him a bonus of £500. And that was it. Nicol’s life immediately following his approximately two week career as a member of one of the most influential music groups in human history wasn’t great. What he did first was reform an old band of his called The Shubdubs under the new name- Jimmie Nicol & The Shubdubs. They released two singles to middling commercial success before breaking up again. As for the over twenty thousand pounds he’d made during the tour, it was reportedly spent within just nine months, with much of the money being invested in his failed band. The media didn’t help, with one British newspaper in 1965 gleefully declaring that Nicol had declared bankruptcy and was over £4,000 in debt. At the same time, his wife left him and took his young son, Howard. Less than a year after touring with the Beatles, Nicol found himself living in his mother’s basement. When Paul McCartney heard all of this on the news, however, he made a couple phone calls and secretly arranged for some session work for Nicol. Paul later lamented, “It wasn’t an easy thing for Jimmie to stand in for Ringo, and have all that fame thrust upon him. And the minute his tenure was over, he wasn’t famous any more”. But things were looking up a bit at this point. After doing various sessions and performances for various groups, the successful Swedish instrumental band, The Spotnicks, offered Nicol a gig and eventually made him a full member of the band. However, drugs later got the better of him and he ultimately walked out on the group while touring in Mexico. Standing in for Ringo was the worst thing that ever happened to me. Until then I was quite happy earning £30 or £40 a week. After the headlines died, I began dying too. Ladies and Gentlemen… The Beatles! The Beatlemania album Nicol can be heard playing in was one of the earliest known uses of the phrase “Beatlemania” and the album itself reached number 30 in the British Charts. Nicol, and indeed the rest of the session band he played with, were uncredited on the album and their likeness didn’t appear anywhere in an effort to trick less savvy fans into thinking this was an official Beatles album. Such albums were commonly referred to as “Top Six Records” as they would involve paying a session band to cover six songs from a currently popular band or group. They’d then release and widely promote the album before the public could cotton on to the fact that the album wasn’t official. Such (often discounted) records were also somewhat popular with teenagers who otherwise couldn’t afford to buy an official album, but still wanted to be able to play their favourite hits at home. Nicol was involved with the recording of several Top Six Records and as a result had a fairly diverse musical background. What a fantastic and interesting story! I’m sure he has a lot of “if only” feelings about that time, such as what if he’d invested his money in refurbishing homes for sale instead of recordings of his new band. He seems to have been a talented musician and served his time well in the greatest band on earth.